By Rev. Cynthia Williams & Verling CHAKO Priest, Ph.D.
Channeled by Rev. Cynthia Williams and Verling CHAKO Priest, Ph.D. Jesus/Jeshua ben Joseph’s My Beloved Connection to Humanity and the Sea is a fascinating read. Jesus begins by telling the reader who God is and how we too are gods. Jesus uses metaphors to help the reader understand how this could be. Taking the sacred number of 12, he weaves the twelve chapters into the rich tapestry of teachings for humanity’s growth. He explains how humanity stepped down its energies on a soul level in order to experience duality in all its variations. Jesus has a deep love of the sea that is evident in the many miracles that he performed in multiplying fish and calming the waters. In our own history, we can find reference to dolphinlike creatures that walked upon the land during the day and returned to the sea at night. The teachings these beings brought forth were all about love, peace, and joy. 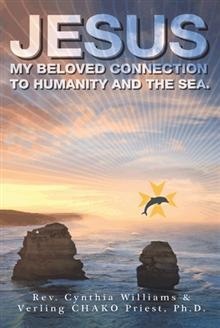 Jesus communicated with the sea world in an ongoing basis. It is his desire for humanity to understand that there is more to his story than what is in the Bible. Jesus Christ asks you to read this book, allowing yourself to awaken your own remembrance from that far distant time. Thank you for your continued interest in my books. The JESUS… book took 2 years to come to fruition. I am sure you will find it was well worth the wait! Note: Chako and Trafford publishing are in the process of converting all of these books in eBook format as well. For information on all of Chako’s books go to http://awakenedhearts.com/2011/08/27/chako-priests-books-the-ultimate-experience-the-many-paths-to-god-series/ and here you will find how to order the books direct from the publisher. They are also available at Amazon and other outlets as well.